Five new-to-the-world products will be displayed at the International Exhibition MEDICUS, DENTO, GALENIA to be held on 24 – 27 October 2007 at the Fairground. About 410 exhibiting companies from 38 countries take part in that reputable trade event, and the occupied exhibition area marks an increase of 4% in comparison with last year. Amongst the innovations there is a revolutionary product stimulating the vital energy and regulating the process of cell growth at a genetic level. The product is jointly developed by companies from Belgium and Switzerland. 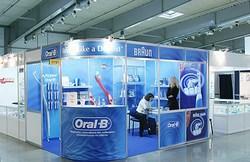 High-tech dental exhibits add to the list of world novelties to be presented at MEDICUS, DENTO, GALENIA. An autoclave designed for the sterilization of dental instruments, and fabrics, both wrapped and unwrapped, could be seen among the exhibits. Twelve new products will be introduced to the Bulgarian market for the first time. The International Congress of Restorative Dentistry is part of the Business Events Programme organized within the duration of MEDICUS, DENTO, GALENIA, traditionally focusing the attention of thousands of foreign and Bulgarian experts and representatives of companies active in the sectors of medicine, dentistry and pharmacy.